BEIJING, April 24, 2018 /PRNewswire/ — On April 16, Marco Polo Technology Co., Ltd, the parent company of PKFARE announced that it has received A round funding with tens of million yuan ($1.6 million). The new round of fundraising comes from the Civil Aviation Investment Fund, Caissa Tourism Group and (CKGSB) Chuang Fund. Beijing ZuoYu Investment Management Co., Ltd takes on the role as its finance advisor. “The reason why we invested in PKFARE is that we lay emphasis on projects related to its innovative technology and big data application. We are confident that the company will take a lead in helping the tourism industry break trade barriers and create a new supply and demand ecology,” said Gao Jian Ming, General Manager of Civil Aviation Investment Fund. “We look forward to working closely with the Civil Aviation Investment Fund, Caissa Tourism Group and (CKGSB) Chuang Fund. With their strong resources and abundant management experience, we will develop PKFARE into a first-class global company and will go public in the future,” said Jason Song, Founder and CEO of PKFARE. In addition, PKFARE signed a strategic partnership with Beijing Zhongguancun Bank Co Ltd, launching a financial product “PKPAY” for the travel industry. PKPAY will offer assistance for small and medium-sized travel enterprises to obtain bank loans, boosting development of the nation’s travel industry. 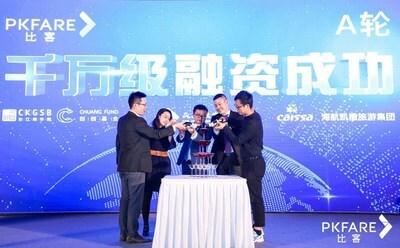 “We offer travel resources and distribution channels for small and medium-sized travel companies, while Beijing Zhongguancun Bank provides financial support and innovative AI-enabled risk control capabilities, creating an Internet Plus finance business model for China’s travel industry,” Jason Sui, Co-Founder and Senior Vice President of PKFARE, said.